This was our first tournament or the year. We went split squad. This first day was an up down 30mph wind so there was not a lot of good ultimate happening. The Y squad went 3-0, winning one game on double game point. The X squad went 3-0 on Saturday also. They won our last game against Michigan on double game point with an upwind break, the only break of the entire game. Sunday was much better weather wise and there was good ultimate going on. X won both of their first games fairly easy. Y won their first game easily and then in the semis the game was much closer. The game was tied 12-12 (game to 14) and Pitt Y was going into a slight upwind. They ended up breaking twice in a row to win the game 14-12. So both Pitt teams made it to the finals undefeated and decided not play the finals and get home sooner. Day 1 game 1. The 12 hour drive is done and we finally get to play as a unified group against other teams. It was cold and a tad bit windy during this round but still nicer than Pittsburgh. During the practices that Nick came to, we had emphasized several goals for the weekend: working to the break side on offense, playing hard, intelligent man D, and utilizing different man D looks and strategy. Nothing earth shattering, but it was nice to know exactly what we were looking for out of every game. Despite all this, we came out a bit to slow for everyone’s liking. The O line was firing, alternating between patience with the disc, using simple throws to work both sides of the field and pinpoint hucks. The D line had trouble forcing anything. Pitt got off to a bad start when Mick got lazy and was beat to the force side cone easily for 1-0 UW-M. Part of the initial sluggish-ness might be attributed to us mixing up lines in practice that week. That may have at least accounted for some chemistry issues early on. But place the laziness at the beginning square on the D-line who did not come fired up and ready to play. There were moments of intensity (namely Marcus being inches away from a layout D on the first throw off the pull) at the beginning, but mostly it was UW-M giving us the disc and us not taking advantage. They got a lot of force side completions without much pressure from the Pitt defenders who were not fighting for good position downfield or coming back hard to the force with their cutters. An attempted IO flick went out the back of the end zone and Pitt had its second chance at a break but a huge layout D got the disc back and UW-M took advantage catching a contested hammer in the back of the end zone for a goal 3-2 UW-M on serve. At this point, Pitt’s man D began pressuring the mark and downfield a little bit more, forcing UW-M to go option 2 or 3 and finally forced a turnover and P-Money hucked to a wide-open Michael Brenner for Pitt’s first break of the year, 4-3. A bailout huck got UW-M on the board again but Pitt’s D was finally coming around. The O is cruising, working the disc easily to either side, Dr. Watson gets open on the force and Pitt is up 5-4. The teams continue to trade to 6-5 when Christian gets up BIG for a D and coms down with a huck from P-Money on the other end for half, 7-5 Pitt. Mick gets a point block at 8-6 and the D converts. P-Money to a skying Alex, 10-6 Pitt. P-Money point blocks and Marcus hits Mick for 11-6 and Pitt is rolling. Pitt does a great job forcing turns at 12-6 but has a hard time punching it in. Finally Alex hit P-Money who leads Dan Wickens into the end zone for the Pitt win, 13-7. Afterwards, Pitt runs sprints for the three O-Line turnovers and prepares for the next round. Pitt hoped to improve its upline and downfield D against Alabama. The O line was cooking, not having been broken against UW-M and the dump-swing offense seemed to be working like a charm. If Pitt could maintain its momentum from the last game, they might be able to make short work of Alabama. Pitt’s downfield D was much improved on point one although Alabama skied for a goal, 1-0. Pitt’s O-Line turned it over on a miscommunication but managed to get the disc back on a turfed dump throw. Alabama was fired up and ready to give Pitt everything it had but Pitt’s offense stayed cool and converted to 1-1. A same 3rd huck went to long and Pitt converted as Colin threw a picture perfect breakmark huck to Bender for the 2-1 lead. A huge Alabama bid went for naught but Pitt gave it right back and Alabama converted. 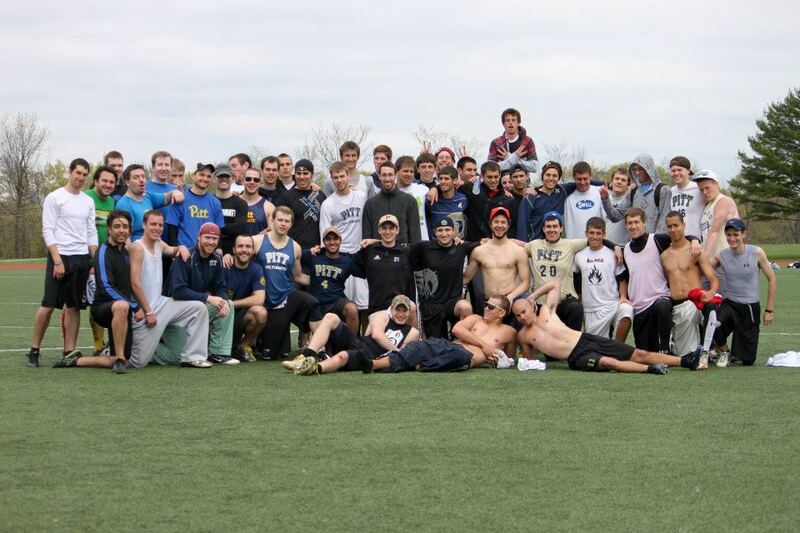 Pitt kept Alabama forcing up bad hucks and Colin found Bender again with a huge sky for another Pitt break to 4-2. Pitt was certainly amped up enough, bidding left and right. Perhaps guilty of playing with too much heart and not enough head, Pitt gave the disc back to Alabama who converted a 50-50 ball to 4-3. The O gave the disc up but Max got up huge in the end zone only to see the O give it over again, this time on a huck. Pitt was restless and it showed as Mick got broken for a huck goal whilst overplaying the dump. However Watson got wide open deep, and Ty found Max in the end zone for 6-4. Amped up, Pitt’s D converted for half. After trading turns, Mick got a layout D on the dump and Colin found him for the bookends. Although Alabama did come down with another 50-50 ball, Pitt was beginning to roll. Ty had a position sky for a goal and, on yet another overthrown huck, Pitt got the disc back and CC led Bender beautifully got the goal to 10-5. A dropped pull at 11-6 got Colin another D and a give-and-go between ZK and P-Money netted another break. Colin got another huge d, and Pitt’s handler motion yielded Mick with an inside break to ZK for the game, 13-6. Again, Pitt had started slow but come around, much faster this time, to cruise through the second half. Better upline and downfield D yielded several Alabama throws to nobody and the O line remained unbroken, working hard on the turn and using crisp, precise throws to march down the field and convert. Password protected footage of the game. Contact David Hogan for access. It is the least you can do, when your opponent has made a 12-hour car trip to the tournament to play you, to give them a good game. If you aren’t very skilled, at least try and make some sort of effort to play hard. Auburn did not. I don’t know if they were a joke of a team all the time or had thrown in the towel already but either way this game was unpleasant. We wanted to continue to work on the things that we had been working on all day: moving the disc to the break side on offense, playing smart, grinding defense, and utilizing all our man-to-man variations. This was tricky. It was hard to adapt to a team that has no offensive system and when the force side is always open, why go to the break? We did a very nice job of focusing as best we could. There was no way to maintain anything near 100% focus but we did what we could. Snowden had a sweet layout score and DelCasino threw up a perfect sky ball for Dan Wickens to begin to patent is two-handed skies. There was a successful conversion of “the Play” (Ty 60 yard hammer to Alex). It didn’t quite manage to put Al in the end zone but we managed to score somehow. Ike had a nice IO backhand huck to Al and Scott had a cool layout D.
We won 13-1. Well, 14-1 because Trent and Tyler Kunsa cannot manage to keep track of score between them. We essentially had another bye round afterwards. We tried trick shots. However no one on the current Pitt A Team is capable of throwing a hammer into a trash can. I speak for the entire team when we say we are sorry to have let the alumni down. This was the 1 vs. 2 game in our pool. The one we were really looking forward to on Saturday. We should have known it was going to be chippy. On the 2nd throw off the pull Jason got a come-through D, but the guy called a foul. No one has any idea why and the guy won’t relent on his call. Bad call number 1. On the second point, Dr. Watson goes deep, boxes out his defender and gets called for a foul. Again, no one knows why. Call is upheld, bad call number 2. On the third point, Tennessee really doesn’t have too much going for them on O. They throw up a huge OI flick which Colin comes over to D from the break side. The guy calls a foul. No one knows why. Bad call number 3. We hunker down on D and start to grind. They have to work for every yard, nothing is easy. We get a D and the break and get on a roll. Agent Orange loved to have a lot of sweep cuts across the Ho-Stack from the break to the force. It was a testament to our defensive positioning that these didn’t work very well. Their offense got cloggier and cloggier and we took advantage. Christian Pitts had a massive sky which we turned into a break. We broke twice before they could hold. Our O had a turn but Max got it back with a foot block and we punched it in Al to Ty. On D, Jason was stopping any sort of handler motion with a sneaky poach scheme. Defenses often say that if the opposing offense wants to throw a ton of short 5 yard open side passes to score, so be it. Rarely does this actually happen. The starting D line forced Tennessee into this. It was a sight to watch. All seven players were working the system together playing excellent individual and team D.
Jason had a beautiful bomb to Christian and we were truly off to the races. Scott Marsh was playing great handler D, Christian was open everywhere on O and DelCasino had a nifty grab in the back of the end zone to take half. Tennessee came with a zone-to-man transition out of half to try and throw off the O line but it was to no avail. Crisp offense sliced right through and we were up 8-2. And by sliced right through, I mean Ty had a beautiful OI huck to Bender for the goal. Back on D, it was more of the same. A turnover on a huck led to a P-Money break huck to Wickens/Snowden. I’m fairly sure that there was a handoff somewhere near the end zone but the point counted. Ty had sweet poach D block on a force side huck, Michael Brenner was wide open in the end zone and we were up 11-2. Mick hucks to Christian and Alex-dropping-a-beautiful-hammer-from-Ty-but-still-scoring-anyway play are sandwiched around a huck for a score from Tennessee and we win 13-3. Great grinding, intelligent, man D from the whole team coupled with the offense rolling along and continuing with its unbroken streak made for our most complete game yet. We were efficient, physical and tough. Hopefully labels that will be associated with us all season long. Sunday, Sunday, Sunday. This is what we had been waiting for. This is what the 12 hour van ride was for: Championship Sunday. Pitt started on offense. Ga Southern brought a junk D that Pitt easily worked around, and around and around again finding the end zone Al to Ty (Classic Pitt). Pitt’s D line had been challenged to come up with three breaks in a row. Hungry to do so they came out pressuring hard and not letting Ga Southern off the sideline, finally forcing a turn on the dump. Marcus to P-Money to Joe sealed the first break of the game. Next point down, Mick layout D’d an in cut and a few dump swings later, Marcus found P-Money. Two breaks down. Pitt got the disc again thanks to a same third huck that sailed too far. Scotty Marsh bombed it to a wide open Christian and it was 4-0. Pitt’s pressure still kept Ga Southern from using too much of the field and finally, frustrated, Ga Southern threw up a huge 50-50 ball that led to a goal, 4-1. Again, Pitt’s O line worked around the zone taking easy pass after easy pass forcing a transition to man D. On the goal line Ty found Alex for and easy goal. More Pitt D pressure forced a miscommunication, and then a pass too far for the receiver. P-Money to ZK for the easy open side goal. Ga Southern likes the same 3rd huck and it works, taking them to 6-2. The O is starting a trend of easy, efficient points that end in goals and the D’s pressure is relentless. P-Money to Bender seems unstoppable but Mick turfs an easy dish pass to Colin on the goal line and then throws away a huck giving Southern yet another opportunity. However, the continual pressure is too much for Southern and Pitt forces another turnover. Scott breaks around to P-Money for half, 8-2. Pitt came out of half ready to play. Jason bombed a massive IO, cross-field flick to a sliding Dan for the goal. Scott’s pressure downfield forced another turn, and Jason ripped a backhand down the line to Snowden to Dan again for a goal. Ga Southern kept trying same third hucks and this one worked. A diving catch brought it to 10-3. Pitt’s O kept working the disc around making easy passes and scored easily on a break to Max, 11-3. Pitt’s D pressure was still working. Southern had trouble with every throw. After trading turns, Pitt forced another turn and finally punched it in, Marcus to Mick. A huge pull put Southern in the back of the end zone but two same third hucks and huge skies bailed them out. Their O was becoming a little more adjusted to constant pressure and was able to have a little more success. Pitt forced them to make plays downfield and they did. But it was too little way too late. Pitt’s O was in cruise control using the whole field and make easy, crisp passes to score quickly. Up 14-5, Ryan Earles had a huge D on a cross field huck. Scott fed Colin, Colin drew the mark over, and ripped a huge backhand to Christian who got up well over his defender to end the game, 15-5. A very solid overall game for Pitt; the O line remained unbroken and the D was able to execute well all game. They were not relying on the other team simply giving away the disc anymore. The D was beginning to earn its turnovers. This game is what we had been waiting for. UNC was not a team looking up at us; they fully expected to challenge and beat us. Pitt was ready for the challenge. It should come as no surprise that there was a contested call on the very first point (hopping in vs. running in the end zone) regardless, UNC scored on an up line. Pitt’s D had to come with more fire. The O responded easily, Max made a huge play deep and Alex then broke the mark back to Max for a goal. Pitt’s D was still having some issues, UNC was able to easily work up the force side until a contested in/out call let Pitt settle and regain its fire. Colin had a great run through D and Marcus found Colin for the bookends, 2-1 Pitt. O the next point Colin managed a deep D, but hurt his knee. Pitt turned it over but Christian came through with a D and P-Money to Bender worked yet again for 3-1. Pitt’s pressure forced a miscommunication to the break side but a huck fell short and Pitt had to do it all over again. Mick got turned around and beat to the force to negate all the hard work Pitt did that point, 3-2 Pitt. However the O line was not adversely affected, Ty to Max for an easy 4-2. A huck too far gave Pitt the disc back and the D line O was able to work up the break but couldn’t quite convert the final touch. UNC’s huck was on point this time and it was 4-3. An IO break went a bit too far and UNC had a chance to break but hucked OB. A huge layout D got the disc back to Darkside but they struggled to convert. Finally, Al found the Good Doctor for a goal. UNC came with a short homie offense which caught Pitt totally off guard (perhaps a testament to how well Pitt’s D was playing, who knows) but near the end zone UNC threw up a jump ball too close to Christian and he got up over his man to swat it away. Quick movement gave ZK an open huck and Bender out-read his man for the 6-3 Pitt lead. UNC got off a bomb to their main receiver almost right away but Pitt’s O was able to answer (albeit after having to earn the D back) on an open side goal to Ty. Quick disc movement got the disc to Colin (he’s back!) and he laid out Christian for half. A beautiful huck from Ike to Max made it 9-4 and UNC had to resort to a homie again. This time it was effective, but Pitt still led 9-5. A greatest by Ty couldn’t save possession, but Ty coming across the width of the end zone for a (HUGE) D could. Al found Watson force side on a fast break for the goal. UNC was working hard on O and got it to the break side faster than Pitt could recover and scored on a dish after a huck. Pitt’s O gave the disc to UNC on an OB huck but clamped down immediately and UNC was forced into a poor decision huck OB. The offense scored as Jason was led beautifully into the end zone and timed his bid perfectly for the goal. Pitt’s D was right there again and UNC had to come down with a jump ball and use the resulting confusion to score. Traditional O was not working for Darkside, a testament to the rapid improvement of Pitt’s D line. Every pass was tough and every yard was earned. Pitt’s O remained unbroken. Isaac found Max with an IO break for the goal. The O got their sync back. UNC had to come with their homie yet again but Marcus stepped up and made one of the plays of the weekend with a massive layout D from behind his man on an up line pass, giving the disc back to Pitt on their own goal line. Pitt’s D line O was excellent. Dump swing to dump swing. A mistimed pass near the end zone gave the disc back to UNC. Pitt had to do it all again. Pitt forced a short turnover and went back to work, and Colin bombed to Bender for another break, 13-7. A bailout bid near the goal line saved UNC on the next point and Pitt’s O kept right on clicking. Brenner had a great two handed sky and huge break to Dr. Watson for the goal. At 14-8, Ryan Earles had another huge deep D and P-Money to Bender clicked again. But after a timeout on the end zone Pitt gave the disc back. And again, Pitt D’d the huck, but tipped the D to a wide-open UNC player in the end zone. No matter, as Max skied for the game winner, 15-9. Pitt’s O line had a bit more trouble holding on to the disc this game. But after every turnover, the O line D worked hard and played very well in getting the disc back. They remained unbroken. Pitt went into the finals on a high note, having played one of its best games. The finals. The game we had all been waiting for. As an added bonus we got to rehash one of our fiercest rivalries, Florida. We have had some great games with them in the past couple years that have all come down to the last point. Speaking for a lot of veterans on the team, we wanted revenge for the universe point loss at Easterns last year. Florida lost some big playmakers from last year, but history shows that underestimating them is silly. Pitt came out on D and got beat to the force side. And beat again. And beat again. And beat again until Florida walked it in for 1-0. This would be one of the last gimme points of the game. Pitt’s O line kept up its effective small ball, working the whole width of the field like they had done all weekend, scoring to 1-1. Florida got off a big huck and made a great play coming down with the goal between two Pitt defenders. The O got back out on the field and ripped a bomb of its own that fell incomplete. But, continuing with their theme of great D following a turn, the O got it back with solid dump D and Dr. Watson scored the goal for 2-2. Pitt started subbing in some O players on D for matchup purposes and Ty beat his man to the disc to force a turn. Dump, swing, ZK to Bender. 3-2 Pitt. Florida was working hard to play good dump-swing-in cut O and Pitt was giving them all they could handle. After a swing, the first spark of controversy flew. Mick’s man got the disc on the break side, threw and started to re-position. Mick, chasing after him, twisted his ankle and called an injury. The throw was dropped, but it was unclear when the injury happened and was called, stopping the play and forcing discussion. Eventually, after much talk, the disc went back to Florida and Pitt had to go back to work. Al, subbing in for Mick, forced a stall and Pitt went on the offensive. Bender threw a nifty hammer to Al for the score up line and Pitt was up two breaks. Another Florida huck went up, this time too far for the receiver and Pitt had a chance for another break. A mistimed catch gave Florida the disc back. Pitt’s D was working harder than ever but Florida remained calm and worked the disc. Another great catch in the back of the end zone shortened the lead to 4-3. Pitt received the pull and zigzagged its way up the field with Jason breaking to Dr. Watson for the goal. Florida got off a nice OI flick for its next goal but Ike answered with a gorgeous OI backhand to a streaking Al for a one throw goal. Pitt came with a zone D and Florida looked to have broken through but a leading pass sailed a bit too far and the Florida receiver was called out by Pitt. Appealing to his teammates, the player called for the throw to be sent back and play resumed after much discussion. After play restarted Jason beat his man to the spot, got the D and Marcus found Dr. Watson for a huge sky, spike and Tebow. Up 7-4, Pitt earned a D on Florida’s goal line when Ryan Earles got a sneaky run through D on the second pass off the pull. Colin to Ty for half, 8-4. Al to Max right out of half for 9-4. Florida got off another big huck but Bender was thereto D it. A turfed throw gave Florida the disc back by Pitt’s end zone but Mick got up big for a dump D and Pitt was off to the races. Ty found a wide open P-Money for the break to 10-4. On the next point Jason came down with a swirling swing pass but Pitt couldn’t convert. Both teams were fighting for every yard and slowly Florida was able to work the disc closer to the Pitt goal. Finally, a swing went just a little too far and Pitt regained possession. Marcus was everywhere on offense and he found Jason with a great inside break to take the lead to 11-4 Pitt. Up 11-5 and on offense, Ike took the first cut, made the play and dumped it to Al at once. Not knowing what else to do, he slid back to a handler spot, basking in his fifteen minutes of cutter fame. Then, Al threw a goal to Ty who was wide open deep. A huge Florida bid couldn’t reel in a huck and Pitt worked it up the force side to Marcus who mistimed his jump, then tried to throw a greatest while still in bounds. Luckily, the disc came back on a foul call and Pitt retained possession. Bender snuck up line but couldn’t quite toe the line and Florida got the disc back. In classic Florida style they completed a deep look for the goal. The O line couldn’t quite connect on an inside break and gave Florida the disc. More controversy. Ty foot blocked a pass on the goal line but was called for the foul and the disc went back. Ty got another point block and another foul was called. Pitt disagreed but play continued, Florida’s disc. They got off a nifty cross field flick and were on the doorstep. Looking to punch it in, Florida tried a small dish by Ty, coming out of nowhere, somehow managed to get a foot on the disc and knock it down. Florida called a foul. Pitt did not agree. Discussion commenced, continued and finally ended with Florida still in possession of the disc. However, all was for naught as Florida turned a dump throw and Al threw to a streaking Ty for the goal, 13-6. Pitt and Florida traded goals to 14-7. Brenner had a nifty IO break for Pitt’s goal and Pitt was only a point away. P-Money had great positioning on a Florida huck and Pitt’s D had the disc for a chance to break to win. ZK found an open P-Money in the back of the end zone with a hammer and Pitt had won Classic City Classic 2011! All calls aside, it was a pleasure to watch Ty and Florida’s #12 match up. It was a great battle between two fantastic ultimate players. Jason and Florida’s #16 were also fantastic to witness. They both played a hard, grueling game. I’m sure it won’t be the last time those matchups happen. Also worth noting: Pitt’s O line got broken zero times all weekend, Pitt’s D line did not give up more than 9 points in a game and Hogan and Trent both double rimmed out during trick shots making them the closest to actually making a trick shot. Decide for yourself which is more important. Pittsburgh started off 2012 on the right foot with a tournament victory, something they were unable to accomplish in 2011. Facing off against surprise opponent Central Florida, Pitt started the game off with a break on the way to a 7-2 lead. Their depth and freshness were obvious as they were able to trade out the rest of the game to a 15-11 victory. The only blemish all weekend was Pitt’s 15-12 loss to Carleton. Every other team couldn’t escape without multiple defeats. The reason Pittsburgh made it out alive? Depth. Most players were not required to play on both sides of the disc throughout the tournament, saving Alex Thorne’s and Tyler Degirolamo’s legs for the final game. While the scores were similar between Central Florida’s semifinal and Pitt’s win over Georgia, it was remarkable how little effort Pittsburgh had to put in to get the job done. There seem to be pieces at every position that are working well for Pittsburgh. Isaac Saul worked well as a distributor from the center handler spot. Jason Kunza filled in on give and goes with Saul when other options were unavailable. Colin Connor, Zach Kaufmann and Marcus Dropcho anchored the defensive line, taking advantage of deep shots and able to work it up the field. After all of this, we haven’t even gotten into Pittsburgh’s stellar freshmen. Max Thorne, Trent Dillon, Pat Earles, Joe Bender, Christian Pitts are 5 freshman starters for Pittsburgh. Thorne and Dillon rounded out the offensive adding an element of athleticism and youthful energy that most teams would be hard pressed to find. Earles has found his position as a puller on the defensive line with Bender and Pitts making big plays themselves. It’s hard to say, but it looks like Bender, Dillon and Thorne are the top 3 in contention to take the freshman of the year in the Ohio Valley. This is of course assuming that that no other team is sporting a freshman, but I’d be surprised to find this talent on other teams. After their lone loss to Carleton, Captain Zach Kaufmann had his squad run sprints in the back of the end zone. Pittsburgh is certainly setting the tone that anything less than a championship this season is a failure, and probably comes out of this tournament as number one ranked team in the country. Coach Nick Kaczmarek seems to be bringing a different attitude to Pittsburgh this year, keeping them focused on adjustments in game and perspective after. It’s early for any accolades, but I certainly like the direction this squad is heading. The top four seeds of the tournament held seed and found one another in the semifinals on Sunday. While Oregon was able to make it to Sunday with relative ease, Carleton and Wisconsin were certainly challenged for their throne atop their respective pools. Surprisingly enough, Pittsburgh had the hardest road to the quarterfinals, dropping a game to Texas and almost losing to both Minnesota and Stanford. Both semifinals lived up to their hype, as the #1 and #2 seeds escaped to the finals, with Carleton and Wisconsin right on their heels. Pittsburgh still looks like the most complete team, especially on the offensive side of the disc. Aaron Watson was back last weekend from injury and had an immediate effect on a line that already had so much talent. Watson’s presence sent freshman Trent Dillon back to the defensive line, where he was able to play looser and without as much pressure. En Sabah Nur seemed to struggle all weekend as they could not find their stride, especially on defense. Pittsburgh’s strength during the Fall and at Warm-Up was their ability to string together multiple breaks, allowing their super-powered offense to play in lower pressure scenarios and hold with ease. With all of their games decided by 1 or 2, players like Alex Thorne and Tyler DeGirolamo were on the field a ton as Pittsburgh was clearly gassed in the final against an Oregon team that was 13 points fresher. En Sabah Nur now is not attending Centex and will take a few weeks off before facing a much weaker field at College Easterns. Password protected team footage of the game. Contact David Hogan for access. Password protected second highlight reel. Contact David Hogan for access. After two tournament victories, and one finals loss, Pittsburgh is finally looking like the championship caliber team that we expected. They blazed through North Carolina, Stanford, and pulled away at the end of the Easterns finals with a 15-12 victory over Central Florida. In past years we’ve seen them make finals of a couple of tournaments, looking like they had potential, but there was always a stumble along the way. With Alex Thorne and Tyler Degirolamo playing like top five Callahan nominees, this may be the year that Pittsburgh at least breaks through to the national final. Thorne and Degirolamo have displayed an ability to be multidimensional in their game both with deep throws and deep cuts. Degirolamo seems to be the weapon that teams are focusing on taking away, but Thorne is making them pay. When teams are trying to force him out, he has found a way to strike deep at the right moment. While the offense has worked well for Pittsburgh the entire year, the defense has been a concern for coach Nick Kazmerak. Not happy with the performance shown at Stanford Invite, he was pleased with the number of turnovers generated at Easterns. Up 10-9 on Central Florida, the defensive line stepped up to put the game away. They extended the lead to 14-10 before Central Florida mounted a small comeback. While there is no guarantee that Pittsburgh will perform at nationals, late season success can’t be a bad thing. Florida and Pittsburgh, two top seeds in 2011, both had sub par series performances leading into boulder (Yes, both squads were in the finals of Easterns last year too). Pittsburgh faced some close games at regionals against competition, winning 15-10 over Millersville and 15-9 over Penn State. Not losing, but a sign that they were not peaking like a championship contender. Thinking about the eventual champions, Carleton? Well they lost games at regionals to the eventual runner up (Wisconsin) and a semi-finalist (Iowa), games that are expected to be tough and actually help teams prepare for nationals. Password protected footage. Contact David Hogan for access. Pittsburgh has two legitimate Callahan nominees in Alex Thorne and Tyler Degirolamo and are the deepest team in the country. The offense primarily runs a spread and are very loose about who stays back to handle and who goes up field. Alex Thorne’s versatility shows this most clearly, but any player on Pitt’s offense is willing to hang back get the dump and hurt opponents with their throws or bust up field. This allows for impressively quick consistent continuation up the field. The defense is fueled by fiery freshman and experienced vets. The transition offense is more structured, but all players still have a degree of versatility. They are the clear favorites, and there is little doubt they will win the region. The real test for them should come at nationals. Pitt’s three best players should all be locks for first team region. They are Tyler Degirolamo, who is one of the fastest players in the country and great in the air, Alex Thorne who has a complete array of throws and uses his quickness and field awareness to get open, and Isaac Saul who is the teams primary distributors and one of the best pure handlers in the country. One could make an argument that many of Pitt’s starters deserve first or second team all-region, but those three are the driving force behind Pitt’s success. The other regional award is far more intriguing, which of Pitt’s class of five freshman should win FOTY? In my estimation three are equally worthy, though they possess very different skill sets. Max Thorne , a part of Pitt’s effective offense, has all of his brother’s ultimate set, though he does not yet have his brothers ultimate IQ. Southpaw’s Trent Dillon is amazingly athletic and is often tasked with guarding the opposing team’s primary option. The most interesting to me is Pat Earles, who is a six foot plus lefty handler that pulls. He has too much utility to be overlooked. The establishment knows it. “First non cut, Wisco, or Florida win since 2005,” read the @cutrules Twitter on Monday. “Darkhorse [that means cool. Or something. ],” replied Brodie. Pitt knows it too. “There have been five teams since the first year that Pitt made Nationals that have been to the final,” said Pittsburgh coach Nick Kaczmarek. “Brown, Colorado, Wisconsin, Carleton, and Florida. Since the second year, only three of them have won it.” Add in 2002 champion Stanford, a regular semifinalist, and you have to go back to 1999 to find a winner outside of the usual suspects. Pittsburgh’s national championship is more than the crowning of a program that has worked tirelessly to reach the top. It’s the signaling of a new era, one in which on-field talent is present upon move-in day and coaching and organizational skills are not monopolized by a few. The best teams are certainly going to stay good (my money is on Pitt to repeat in 2013), but today’s explosion of youth, athleticism, and hunger to succeed makes me think that the throne is going to become a bit more accessible. Thorne’s throws took down Wisconsin. When the Hodags went man, he hucked it upwind (the full-field upwind backhand), downwind (he placed it perfectly into the downwind endzone, something that Wisconsin missed on multiple times), and break side (that backhand break that Tyler DeGirolamo got up huge for). When they threw zone, he found the open guy (usually with a blade to his brother Max, who was standing 35 yards downfield in between a wing and the deep deep). And when they needed to work it, he did that too. Before the game started, one of the announcers said that the wind (I didn’t really know how windy it was until the first Wisconsin pull went up and barely reached half field) would favor the Hodays. Hmm. Thorne’s throws are really good. Really, really good. I first noticed how good they were when he was shredding zones with cross-field dimes at the super windy Easterns 2011. Wind or no wind, he puts the disc where it needs to be when it needs to be there. When that kind of thrower is the centerpiece of your offense, I think the wind favors you. The Hodags have always built an identity in playing tight and relentless man defense, and given their dismantling of Oregon, I don’t think anyone was surprised to see them rely on it early in the final. When Pitt’s offense came out hot though, I liked Wisconsin’s decision to slow them down by going zone. The problem was that aside from the turn they got when Isaac Saul threw one dish too many and a cup member swatted it down from behind, Alex threw over the four-man cup and downfield pretty easily. I think they should have switched to a three-man and bumped the extra defender downfield to cover the gap. He was going to throw over them even if they had six guys in that cup so they may as well have conceded some swings and looked to make Pitt throw it more. A friend that knows Wisconsin pretty well noted that the Hodags have always had trouble maintaining a cohesive cup or wall. With a team built on making plays man-to-man, this makes sense given that the cup is more about moving as a unit whereas playing wing or deep can still boil down to making a play as an individual. Perhaps Wisconsin should have stayed man for a few more points, tinkering with match ups until somebody stepped up and made a block; the same friend thought that Tom Coolidge could have stayed with Thorne and, at some point, would have given him trouble. Before the game, announcer Tyler Kinley said that Wisconsin coach Hector Valdivia’s plan was to focus on shutting down the players around Alex Thorne in order to force discomfort and, subsequently, turnovers. In other words, he was acknowledging that Thorne was gonna get his and choosing to put resources into stopping the supporting cast. I’ve always liked this logic, but maybe Wisconsin should have gone more all-in on bodying Thorne and backing DeGirolamo. Really though, Wisconsin’s fatal mistakes were on offense. Taking a look at the score progression at Leaguevine, Pitt broke to go up 2-0, 3-0, 4-0, 7-4, 9-5, and 11-6 while the Hodags’ only breaks were to make it 5-3 and 7-5. Pitt’s dump defense made resets very difficult and their physical fronting made downfield cutting discouraging, and both led to offensive miscues. When a team’s offense is as versatile and stingy as Pitt’s, you’re going to lose if you’re not just as good. The 4-0 hole pretty much meant game over. Pitt’s glaring losses for 2013 are Colin Conner, and Julian Hausman. Conner, a senior captain, was a key defender with good pulls and a big team leader. Hausman, a fifth year, was this year’s best mark and played a huge role in the semis comeback against Carleton. Senior Jason Kunsa, a steady O-line handler and strong dump defender, is also a significant loss. I think Pitt will be fine, though. First and foremost, Alex and Tyler are coming back. That college ultimate’s most potent duo is giving it another go should scare everyone else in the division. Beyond that, this year’s freshman class was nasty. On top of Max Thorne and Trent Dillon, talent that everyone knows about, Pat Earles is a great thrower and Joe Bender is a workhorse that will find his role just fine. Also, Marcus Dropcho and Michael Brenner are names that I heard here and there but I think are still waiting to burst out of their shells. Add in some role players stepping up their games and a freshman class that I’m sure will be good (they’re getting at least one Junior Worlds player in Jay Boyle) and Pitt looks like its in good shape to defend the throne. Congrats, Pitt. You’ve joined the list. Carleton and Pitt came into their semifinal bout relatively fresh, having disposed of their quarterfinals opponents quickly and easily. Pittsburgh looked somewhat shell-shocked in the first half, trying to move the disc too quickly after breaking through Carleton zone and junk looks (and subsequently turning the disc over). Carleton’s D-line offense punished these turns and vaulted CUT to an 8-3 halftime lead. In the second half, Pittsburgh stepped up its defensive intensity behind the inspired play of Julian Hausman and freshman Trent Dillon. Pittsburgh’s defensive team also capitalized more efficiently on its break chances, much like CUT did in the first half. After a completely unexpected 9-2 comeback run, En Sabah Nur clinched a finals berth by winning 14-12 in the hard cap. If Pittsburgh appeared to be the more nervous team in the first half of its own semifinal, En Sabah Nur certainly appeared to be the more confident team in the first of today’s national championship game. After missed connections on Wisconsin hucks and execution errors on simple Hodag swing passes, stacked Pittsburgh defensive units treated the disc like gold and broke three times in a row to put En Sabah Nur up 4-0 early. The Hodags regained their footing to muster four points before half time, but they were unable to manufacture the breaks they needed in the second half. Unable to close the consistent four-to-five-goal gap (despite valiant efforts from Colin Camp on offense and Tom Coolidge on defense), the Hodags fell to Pittsburgh by a score of 15-10. Pittsburgh’s swarming defense, even after offensive turnovers, proved to be a major difference maker for En Sabah Nur. Wisconsin handlers Dan Park, Dayu Liu, and Alex Simmons had to fight for every single reset, thanks to the steadfast marking of Julian Hausman, Trent Dillon, and Jason Kunsa. Tyler Degirolamo patrolled the deep lanes and produced important skying blocks. Alex Thorne was another difference maker, as he showed why he finished in the top five in Callahan Award voting with a remarkable offensive performance. When the Hodags threw zone defenses, he touched the disc every other throw and threw massive zone breaking flicks. When he was the centerpiece of the offense against man defenses, he threw pinpoint hucks to star receiver Tyler Degirolamo and his brother, Max Thorne. Thorne finished the championship game with three goals, five assists, and an 88.6% completion percentage. Pittsburgh had reached the national semifinals in years past, but today represented En Sabah Nur’s first trip to the national championship game and first national title. In addition to taking home some fine hardware and medals, Pittsburgh was awarded ,000 by tournament sponsor Cort U Student Rentals. The B team qualified for D-1 Regionals for the second straight year and got their win in their history at Regionals.